Thousands of boat people are currently arriving at the Greek Aegean islands. Most of them end up homeless and destitute because there is no governmental support at all. Greece and the European Union have the responsibility to receive and accommodate the stranded refugees in a humane way. While the European Uni­on dis­cus­ses, whe­ther 16.000 refu­gees from Greece could be relo­ca­ted to other EU sta­tes wit­hin the next two years, 11.873 new pro­tec­tion see­kers arri­ved in Greece this April alo­ne, main­ly on the Aege­an islands. The majo­ri­ty of the refu­gees comes from Syria and Afgha­ni­stan. Alrea­dy in March 6.583 bor­der crossings to Greece were regis­te­red. This means that in the last two mon­ths alo­ne more refu­gees arri­ved in Greece than the EU is con­si­de­ring to relo­ca­te. The plan­ned relo­ca­ti­on of 16.000 refu­gees the­re­fo­re isn’t more than a drop in the oce­an. The situa­ti­on in cri­sis stri­cken Greece, espe­ci­al­ly on the Aege­an islands is dra­ma­tic. Our col­leagues from the Refu­gee Sup­port Pro­gram in the Aege­an (RSPA), which has been initia­ted by PRO ASYL, are active the­re and have been offe­ring legal and soci­al sup­port to refu­gees sin­ce the begin­ning of 2015. Homel­ess­ness is one of the most urgent issu­es. On Kos the­re are no accom­mo­da­ti­ons apart from a pro­vi­sio­nal­ly trans­for­med empty hotel wit­hout sani­ta­ry faci­li­ties. On Les­bos it has beco­me vir­tual­ly impos­si­ble to find sui­ta­ble accom­mo­da­ti­on for the boat peop­le. Most of them arri­ve near the port of Moly­vos. Then they first have to cover a distan­ce of 70 kilo­me­ters befo­re they arri­ve in the islands capi­tal Myti­li­ni. Sin­ce bus, taxi and car dri­vers can be punis­hed for “sup­por­ting traf­fi­cking” when they take along refu­gees, many pro­tec­tion see­kers are forced to make the long jour­ney by foot. The recep­ti­on capa­ci­ties in Myti­li­ni are long overstret­ched. The detenti­on cen­ter of Moria, which was desi­gned for 250 per­sons, alrea­dy hosts over 1000 peop­le. Refu­gees are forced to camp out in the open; many of them sleep at the har­bor. The homeless have no access to sani­ta­ry faci­li­ties, food or water. The­re is soli­da­ri­ty amongst the citi­zens who often pro­vi­de some help, but sta­te-orga­ni­zed sup­port remains absent. The situa­ti­on on other islands such as Samos, Chi­os, Leros and Rho­dos is simi­lar. 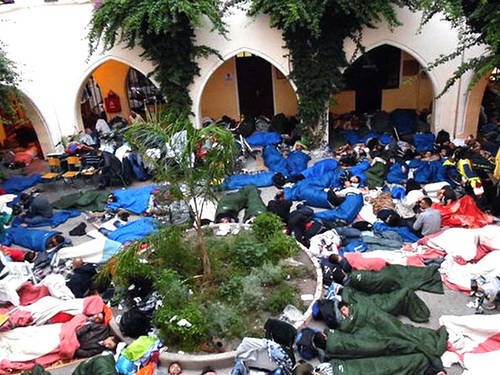 The island of Kos has been in the focus of the Bri­tish press late­ly sin­ce some tou­rists felt so dis­tur­bed by the pre­sence of nume­rous homeless refu­gees that they descri­bed Kos as a “dis­gus­ting hell­ho­le”. Which hell the refu­gees had to flee from and which human rights vio­la­ti­ons they might still have to suf­fer from was not men­tio­ned in this media coverage. Tog­e­ther with our part­ners from RSPA as well as other soli­da­ri­ty groups from the islands, PRO ASYL demands from the Greek government to imme­dia­te­ly take mea­su­res to coun­ter the huma­ni­ta­ri­an cri­sis. The respec­tive aut­ho­ri­ties have to allow for pri­va­te, vol­un­teer help. It is unac­cep­ta­ble, that soli­da­ri­ty and hel­pful­ness are under thre­at of pro­se­cu­ti­on and punish­ment. Alter­na­ti­ve recep­ti­on faci­li­ties have to be found urgent­ly and the­re is a need for trans­por­ta­ti­on for refu­gees on the islands and from the islands. The­re still is no func­tio­n­ing recep­ti­on sys­tem in Greece, which has been cri­ti­ci­zed by PRO ASYL for years. The new government has announ­ced impro­ve­ments, now action needs to fol­low. Howe­ver it isn’t only Greece who is respon­si­ble for refu­gees: Euro­pe can­not lea­ve coun­tries at its exter­nal bor­ders alo­ne. An imme­dia­te generous huma­ni­ta­ri­an relo­ca­ti­on of par­ti­cu­lar­ly vul­nera­ble per­sons from Greece is nee­ded, espe­ci­al­ly of unac­com­pa­nied minors. Fur­ther a well-equip­ped cri­sis fund for the estab­lish­ment of huma­ne recep­ti­on capa­ci­ties and for secu­ring medi­cal tre­at­ment for pro­tec­tion see­kers is nee­ded.